As I’ve mentioned before, I’m not much of a “just-for-fun-book-reader”. I enjoy reading short articles, informational pieces, recipe books, and other DIY or informative books… but I rarely read anything just for fun. Dave, on the other hand, is an avid reader, constantly reading one or more books at the same time — usually on his phone. 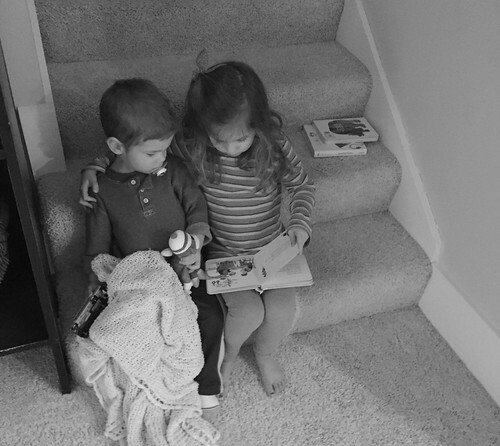 I hoped our children would take after Dave and his love for books and reading… so far, it seems they have! However, even though I personally don’t read just for fun, I spend a fair amount of time reading to my kids AND taking them to the library. Right now, we go to our local library at least once a week, and the kids really look forward to it. 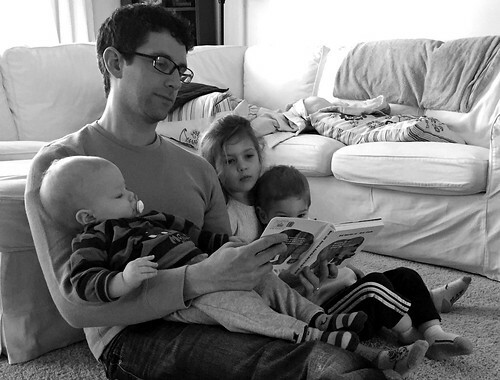 We often walk (Nora rides her bike while I push the boys in the stroller) and the kids do puzzles, play with the toys, or look at books while I return our old books and check out new books. 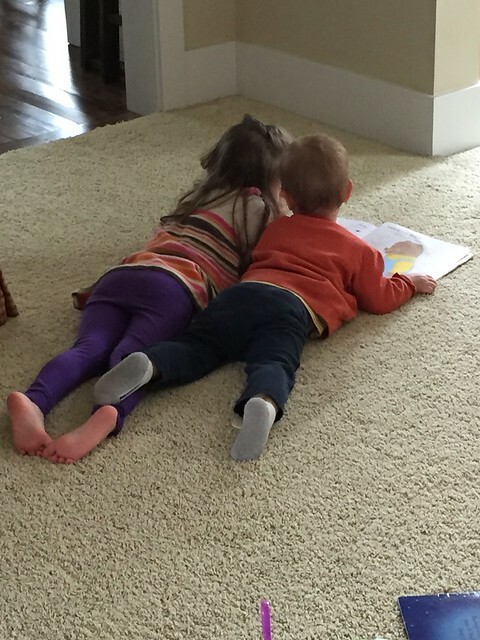 The kids are not always quiet, they don’t always play perfectly together, and they almost always protest when it’s time to leave — but for the most part, our library experiences are fabulous, and I am so thankful for ALL the free resources it offers our family and our community. 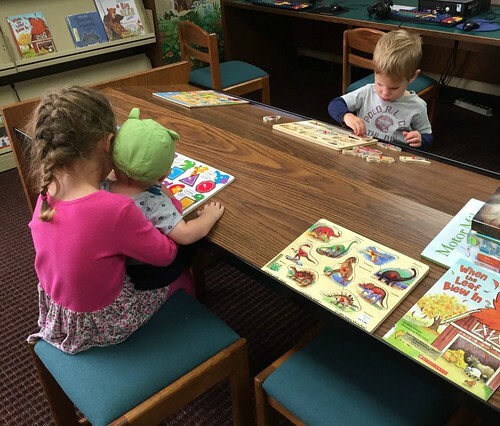 I realize that going to the library (especially with small children) can seem overwhelming if you’ve never done it before; however, I would encourage all of you (no matter your age) to visit your local library every once in awhile. Even if you aren’t a big reader like me, there are still so many free programs and resources you can take advantage of. Nora goes to story hour for 1 hour each week and I take Simon and James to a Wee Wigglers class for about 45 minutes while Nora is at preschool. Both programs are completely free and a great casual opportunity to get out of the house and meet new people. Nora and Simon did the free summer reading program at our library this past summer and both of them got a bunch of great prizes — free restaurant coupons, free bowling, free rides at our local fair, free books, candy, small toys, etc. Believe it or not, several of our local friends are a direct result of our weekly library visits. We ended up seeing the same people regularly, started chatting, and now, a couple years later, we regularly spend time together outside of the library! Our library always has an extra special day of crafts, snacks, stories, games, etc. a week or so before each major holiday. It’s busy, but the kids have SO much fun — and we always try to arrive a little early to beat the rush! I haven’t been able to take advantage of this as much as I’d like, but they offer a TON of adult programs for our community. Everything from lectures and book clubs, to yoga and group coloring sessions. Our library also offers programs for middle school and high school age kids (usually with free pizza, donuts, or treats of some kind). Since I can’t really afford to leisurely browse through thousands of book when my kids are with me, I use our library’s online ordering to “request” the books I want each week. Not only does this save me boatloads of time and stress at the library, it also allows me to request books from a bunch of other libraries and have them sent to my local library. I get a quick text message when my books are ready and they are in a nice stack, just waiting for me when I arrive! Our library has a nifty self-checkout station where I can quickly check my books out without waiting in line. Our library has a wall of backpacks available for check out, and the contents of each backpack is based around one theme (geology, farm, trucks and trains, solar systems, colors and shapes, etc.). Obviously, some of the themes or subjects are too advanced for my kids, but we love the preschool age backpacks. They are filled with puzzles, games, wooden toys, and at least 3-4 books on one specific subject. We try to get one back pack every month and the kids really look forward to it. Not all the DVDs are free, but there are a bunch of DVD’s and VHS’s that we can check out for free each week. Thanks to the fact that I can order all our books online, I can organize them by subject so we read a bunch of books about the same thing at one time. For example, I just got Nora 4 or 5 books about Creation since that’s what she’s talking about in school and the Children and Worship program at our church. 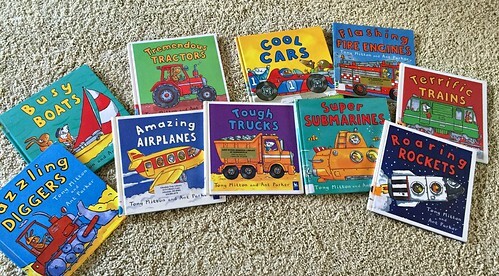 Simon currently has at least 5 books about fire engines, and I also requested 5-6 books about Fall, pumpkins, apples, leaves, etc..
Of course, I still get other books each week (like Nora’s American Girl books) but it’s fun to have themed reading opportunities so we can learn a lot about one specific thing at the same time. We only have a handful of our favorite books at home — the rest are on a weekly rotation from the library! 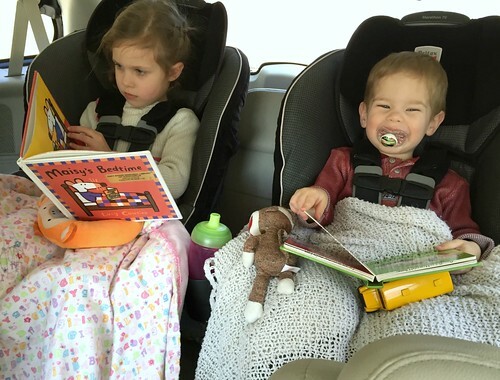 Now obviously, the library can’t take full credit for my kids’ current love of books and reading — but I’m confident that our regular weekly library visits, along with ALL the free programs and events at our local library, have played a significant role in getting my kids excited about books. 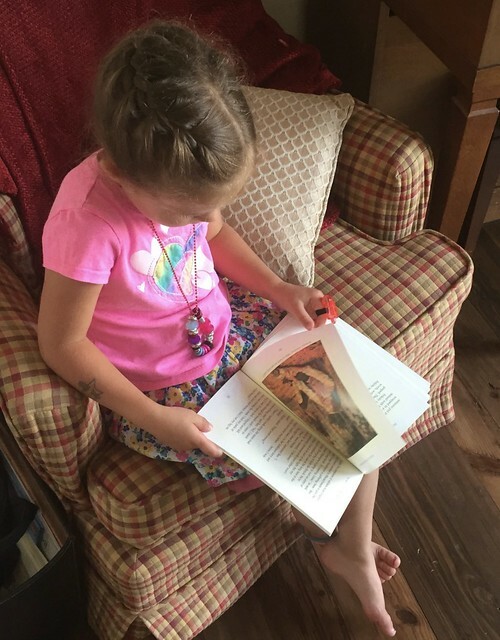 Nora is not even 5 years old yet and she can easily sit and listen to someone read her stories for over an hour without getting antsy or wanting to do something else. 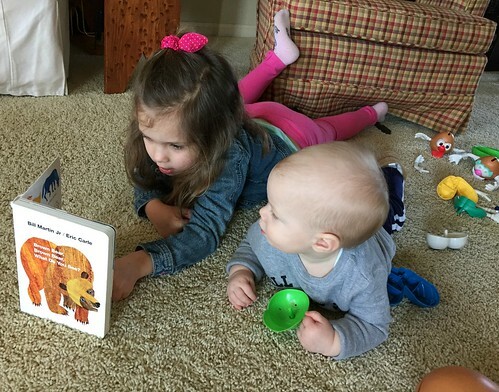 She can’t actually read herself yet, but she has many short children’s books memorized and frequently reads them to Simon, James, her dolls, and anyone who will listen. 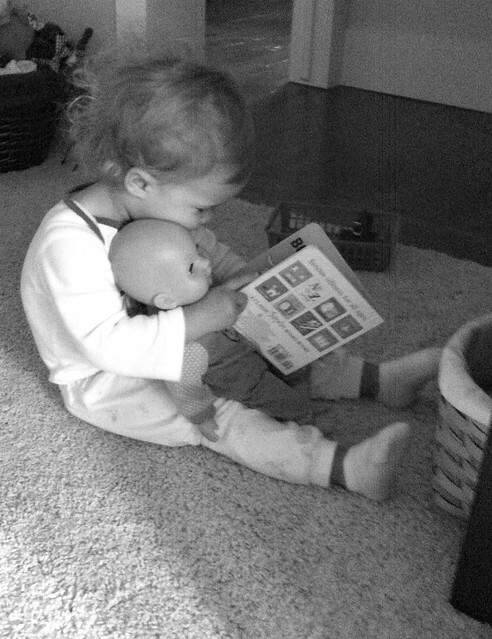 I can’t wait for her to learn how to read on her own! 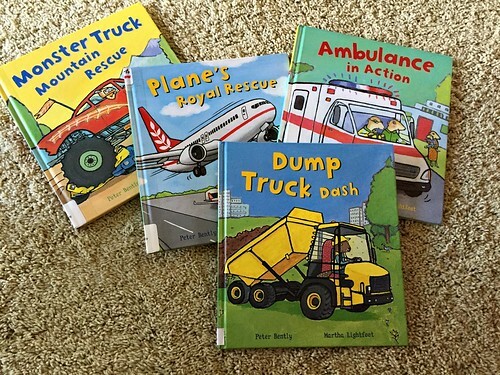 Simon also enjoys reading — specifically books about trucks, police cars, fire engines, airplanes, and ambulances! 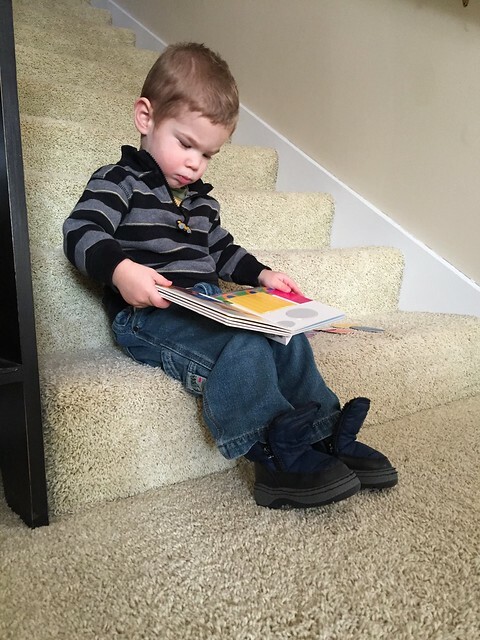 Almost every single morning, the very first thing he does when he comes downstairs is make a pile of “his” library books, sit down right by the bookshelf, and start flipping through the pages… and he always needs to read at least a couple books before his nap and before he goes to sleep at night. What are your favorite features of your local library? 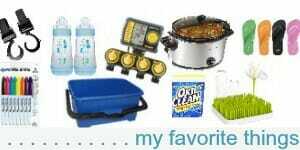 Filed under: Life • Family • Parenting • Children • Frugal Living • Misc. We go to the library multiple times a week….for programs and just to hang out. There are usually other stay at homes moms there, too, so it’s nice to let the kids play and have an adult conversation! I know — the adult conversation is what keeps me going back! I loved taking my children to the library when they were little and even moved to this part of town because it had such facilities. Now they are much older they go there after school as a space to do homework in a focussed space. Alas in uk so many libraries are being axed to save money. Ours will be demolished in January. I wish the govt. Understood whst is being lost, your post sums it up perfectly. oh that’s sad… I wonder what they will do with all the books? I also love to read, and usually check out several books for myself, and I use the library Overdrive site to get e-books and audiobooks on my phone. 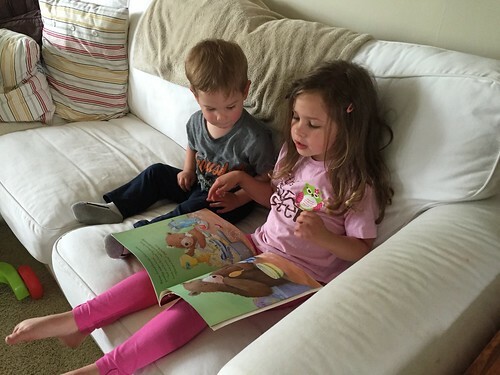 We love the reading programs and the story time too! I’m very thankful that we have such a great library in our town. When I saw your post we were just getting back from the library. I love their kids’ programs and parenting workshops and the fact that their shelves are well stocked. They even do overnight camping indoors, to solve misteries or to find treasures – our kids are way too small to do that, but I can hardly wait! oh wow — that is quite a drive! I’m not sure I’d be as excited about our library if I had to drive 45 minutes one way. Good for you! 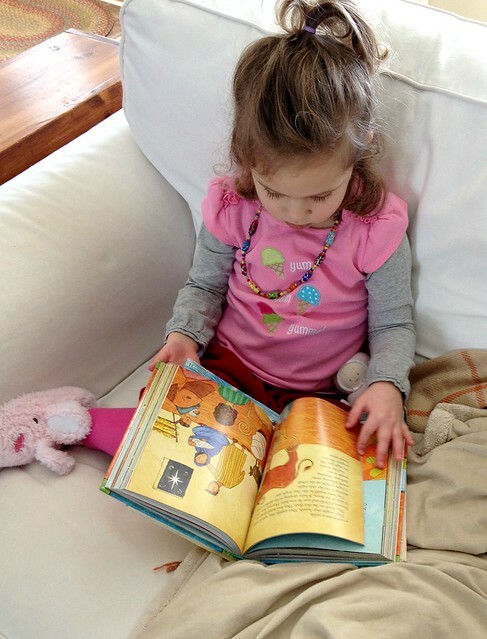 Little readers make great learners. 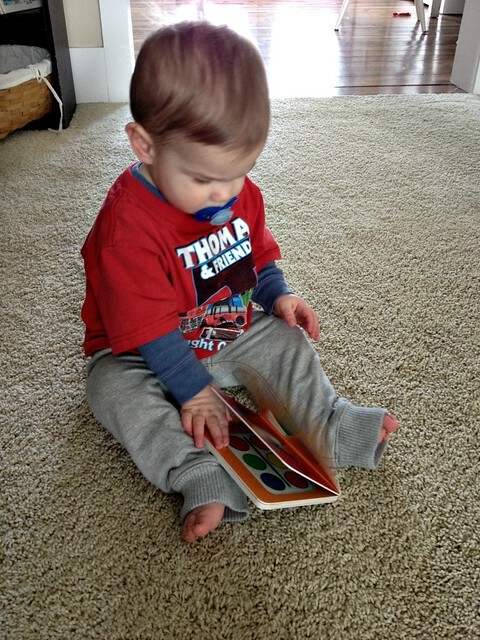 I love books and have passed it on to my grandson. Our library offers the request and pickup. Best thing ever! I joke that my car could get to the library on it’s own because I go so much. I use to teach four and five year olds and sadly some children did not know how to even open a book from front to back. 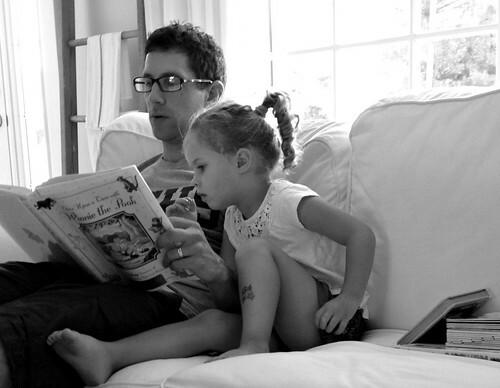 Happy reading to you and your children. 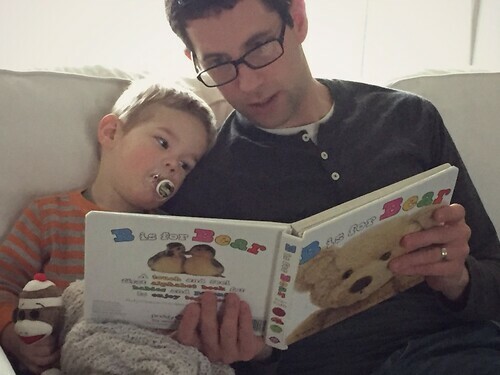 Funny you mention this — I was just telling Dave how weird it is that Simon has just started wanting to “read” the books on his own, and when he does it, he always goes from the back of the book to the front. 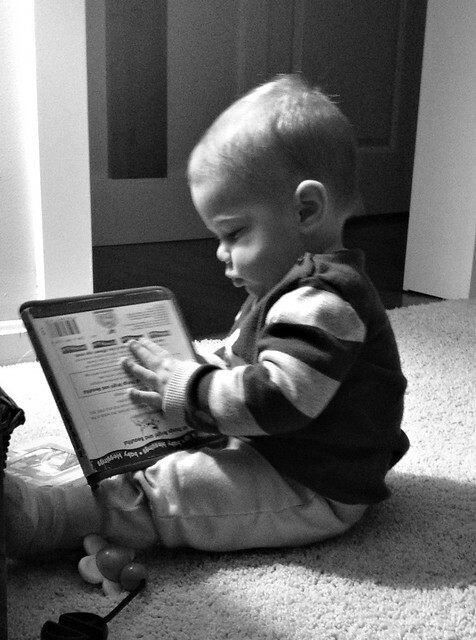 It’s like he hasn’t been paying attention all these years as we read from the from to the back! Plenty of kids sleep with dolls or teddy bears. But when my older daughter was about 1 1/2, she went to sleep every night with a book on her chest. For months and months she HAD to have a book to sleep with. 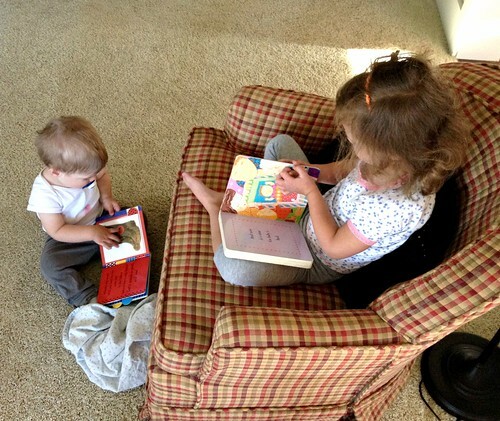 After she was asleep I would tiptoe in and remove the book. She finally outgrew it, but I loved it while it lasted. haha!! All my kids slept with (and still sleep with) various things in their bed. Right now, James insists on having 3 pacifiers — one for his mouth, and one for each hand! I love how you guys can walk and ride bikes everywhere! It sounds like you live in a great, family friendly town. We live between a couple of little towns and have to drive 10-15 miles to go to a good library or anywhere else. We don’t even have a neighbor to visit, closest friend is 3 miles away. But we do love our home and spending time in it! Yes, the location of our house was a HUGE selling point for us! Awe, I have good memories of enjoying the library with my son. 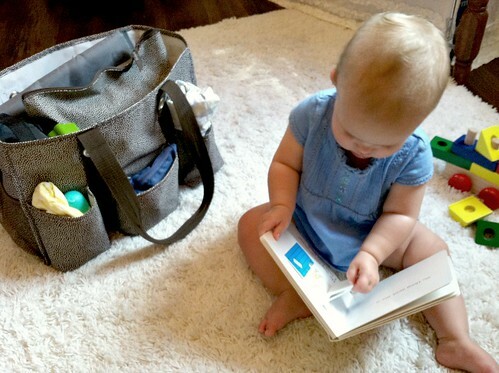 By the way, I love your bag! This post inspired me to check out our library again. 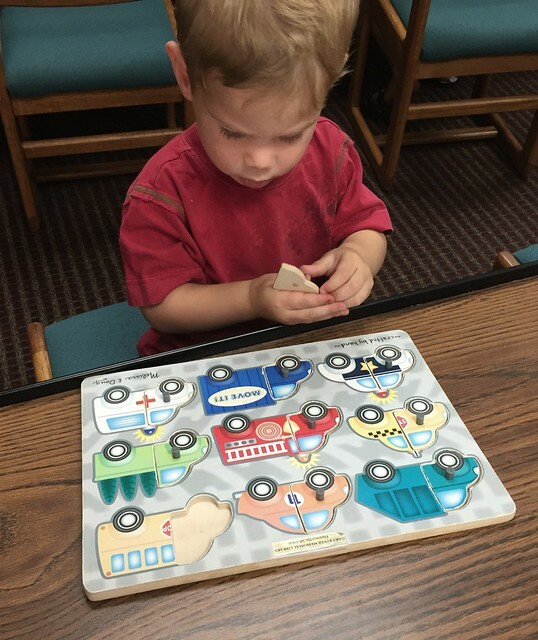 We moved to a new town last year and our trip to the library did not go well with my then 2 year old. But, she’s older (and wiser) and easier to wrangle now. And she does love reading. 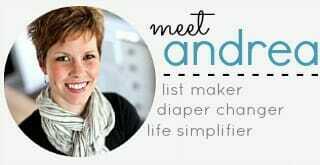 I checked their website and not only do they have story times – they have DANCE parties. I can’t wait to take my daughter. Thanks for the inspiration. Our library is pretty amazing for a small town. We actually hardly ever go to the library, but we use the library services all the time. We get access to OverDrive. You sign in with your library card number and then you get access to tons and tons of ebooks and audiobooks that you can download to any device. They automatically “time out” when they’re due so it’s impossible to have late fees. Love it! Yes, Dave does a lot of the digital books too. He loves them! I love love love our library… we have all you mentioned above.. the biggest thing for me is that i can renew our books on line.. cause if I know I am just not going to make it on the due date.. I can just go in and hit it for one more day/week and I will not get charged ! 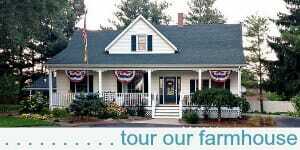 we also have free passes to several museums in the tri state area.. it is wonderful..
yup! There have been so many times when I think “oh, I need to get to the library to return that book” and then I remember I can just quickly renew it online and bring it back the next day! Also, we get the museum passes too — but our kids are kinda young for that yet so we haven’t used them. Maybe in a couple more years! We too, visit out local library a LOT! With homeschooling (ages 7, 8, 12, and 14), it’s so nice to be able to get a stack of books coordinating with what we’re currently studying in school. 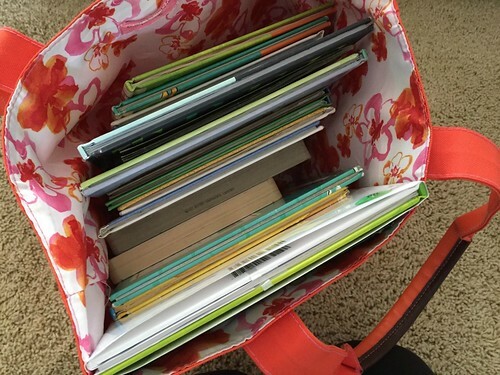 I go on the website and request books to go along with the next week’s lessons, and when they’re ready we go pick them up. 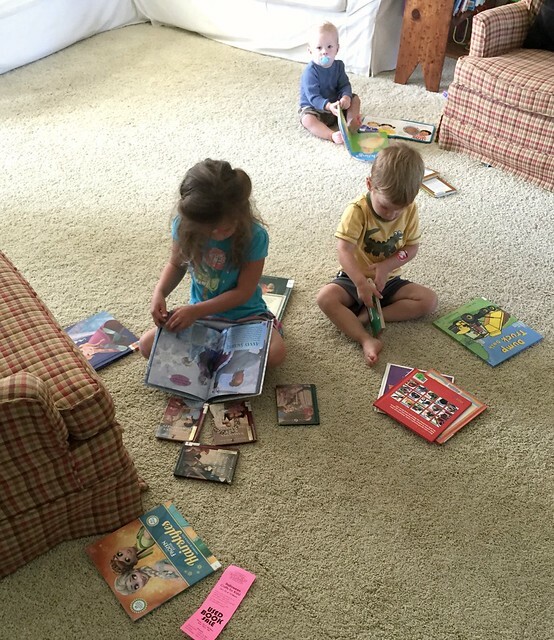 Then we have what we need for school, and the kids can look around and find books they enjoy. In the summer we ride out bikes there a couple of times a week, and just sit, read a book, and enjoy the air conditioning! We LOVE our library! !